Imavere dogshow, Estonia BLANCO SOLAR JAGUAPE - Best of Breed Baly & Promotional Prize - Thank you judge Elena Agafonova, Italy Imavere koertenäitus - BLANCO SOLAR JAGUAPE - Tõu Parim Baby/Eriauhind! Palju õnne omanikele!!! Blanco Solar Isla - Best Female, Rus Jun CAC, Best Junior and Best of Breed!! Congratulations to owners with new title for Isla Junior Champion of Russia!!! Blanco Solar Hualka won Best Female, Cacib, Estonian Winner 2018 title and now is Estonian Champion! Blanco Solar Isabel was second in intermediate class with mark excellent! Congratulations to owners with top results! You are just amazing people! Thank you!!! 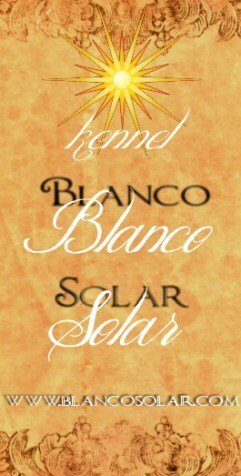 Blanco Solar Hualka exc with CQ, LV CAC, Best of Breed! Hualka is Latvian Champion now!!! Congratulations to owners!!! Big Thanks to judge Dušan TRAVNIKAR Croatia!!! Blanco Solar Hualka on nüüd Läti Tšempion! Oli näitusel Tõu Parim!!! Palju õnne omenikele mega-super tulemuste puhul!!! Blanco Solar Isabel - Best Female, LT CAC, N, Best of Breed! Isabel is Lithuanian Champion after conformation of Latvian Champion. Many thanks to owners for all! Blanco Solar Isla Double Best of Breed Junior, 3 Jun CAC, Double Best of Breed! Thank you judges! Congratulations to owners with such debut! 15.04.2018 International Dogshow "Tallinn Winner 2018"
Blanco Solar Hualka - Best Female 1, CQ, CACIB, Tallinn Winner 2018 and Best of Breed! Thank you honorable judge Miklos Levente, Hungary for estimating this female! Huge congratulations to owners!! !